We are Angela and Louis Rousse, and we live in Michigan with our children Austin (born in 2012) and Emma (born in 2016). When you are around our son Austin, you are likely to be smiling. He has an amazing personality – full of fun and mischief! Austin has been a fighter from a very young age. When a cardiologist discovered that Austin was in heart failure at the age of one month, he was given medications to keep his heart beating. Through nothing short of a miracle, a very large hole in his heart healed slowly over time without requiring surgery. We knew throughout Austin’s infancy that he was behind most children his age in almost all aspects of development. We were told repeatedly that the delays were due to his heart issues, and that he would catch up. However, when he still wasn’t walking at two years old, we took him to a neurologist and demanded an MRI. The MRI revealed multiple issues that pointed to a possible genetic cause. 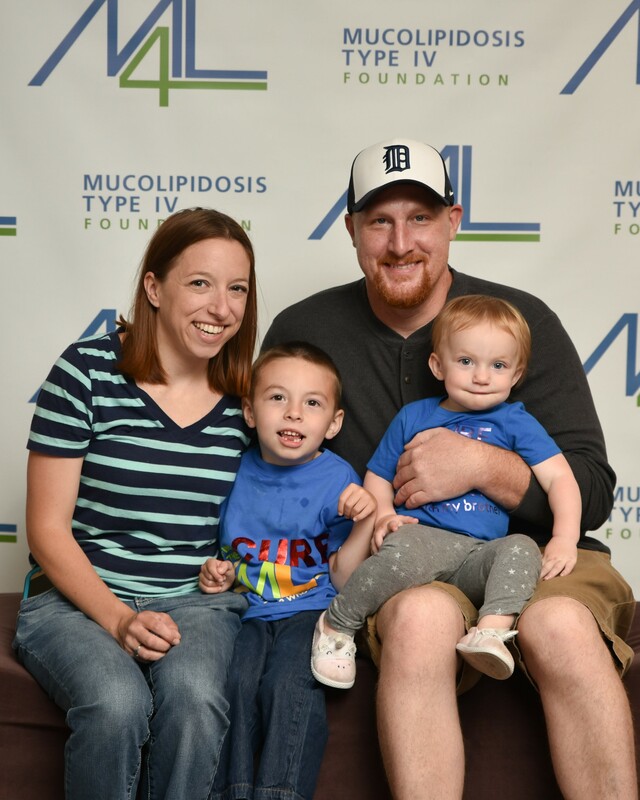 He was referred to the University of Michigan’s Pediatric Genetics Clinic, where months after testing he was given a diagnosis of ML4. 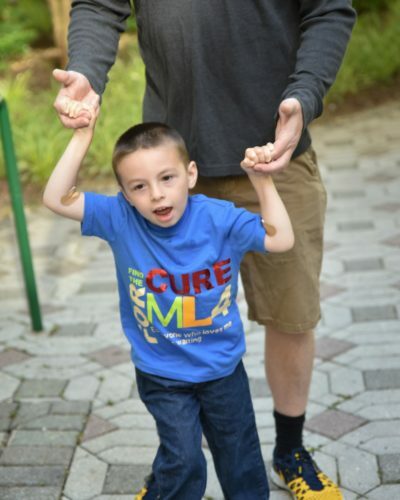 Austin started kindergarten in 2018, and he receives physical, speech, and occupational therapy. His therapies are tiring, but very helpful in improving his communication and mobility. His main mode of transportation currently is crawling, but he also walks in a gait trainer or holding onto our hands. Austin has created his own hand signs for many of the things he loves to do and uses those signs to communicate. One activity he enjoys is pushing buttons on hand-me-down cell phones to pretend to call people. 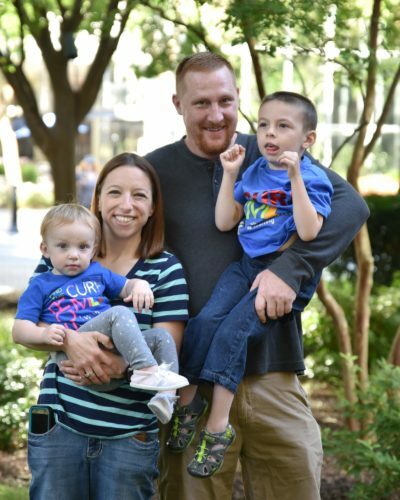 Music makes Austin so happy, and he loves to dance – especially to The Wheels on the Bus and The Itsy Bitsy Spider. One of his many nicknames is “Tricky-Trickster” because he is always trying to get people to laugh by playing tricks on them. His absolute favorite thing to do is swim! He asks to go swimming just about every day, and likes to get in his raft, kick his legs, and swim around the lazy river at the local YMCA. Because Austin is unable to take care of himself, he requires attention almost the entire time he is awake. Transporting him is becoming more challenging as he gets older and heavier, especially in our two-story home with upstairs bedrooms. We are sad that Austin’s days as his mom’s number one “shopping buddy” may be near an end. He is now too big for Angela to lift into a cart, and having to maneuver both a wheelchair and shopping cart is difficult. The ML4 Foundation gives us hope. They surround us with other families and information so that we don’t feel alone in this struggle. They work tirelessly to find treatments and because of them, the future doesn’t seem so bleak. We have made it our mission to raise money and awareness so that Austin may one day walk and talk with his little sister! We are Alissa and Chris Marino and we live in New York with our daughter Danielle, who was born in 2003. 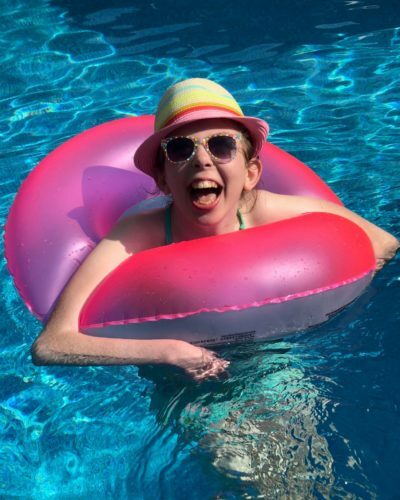 Danielle is happy and social and has a smile that lights up a room! She loves people, food, going to the mall, horseback riding, playing baseball, swimming, talking about her birthday and listening to Lady Gaga. She’s happy to be surrounded by people, and especially loves having someone talk to her about all of her favorite things. Danielle began wearing glasses for strabismus when she was 3 months old. She was a happy but quiet baby and was slow to reach milestones. When the time came for her to start crawling and walking, we could see that she was delayed compared to other babies her age. Our lives were forever changed at a routine eye exam when Danielle was about 12 months old. The doctor noticed an issue with her eyes and he suspected that she had cataracts. He then referred us to a cornea specialist, who performed an eye exam under anesthesia. The doctor determined Danielle did not have cataracts, but instead had clouding of the corneas. He suggested we begin genetic testing to determine the cause of the corneal clouding. Danielle underwent a tremendous amount of testing for a countless number of diseases and disorders and all of the test results were negative. A visit to a renowned cornea specialist was finally the turning point in the search for a diagnosis. He placed Danielle on the cornea transplant list and suggested she undergo testing for one final genetic disease that he wanted to rule out called Mucolipidosis Type 4. She then had a skin biopsy performed at NYU in February of 2005, and the ML4 diagnosis was confirmed (after the ML4 diagnosis was confirmed Danielle no longer qualified for a cornea transplant). 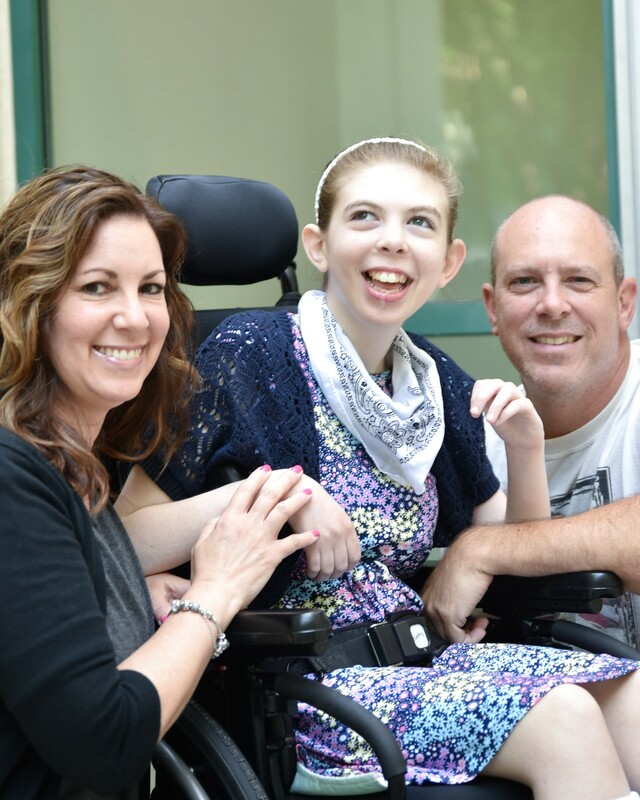 Now a teenager, Danielle attends a school for physically disabled children. She receives numerous therapies in school and at home, including physical, occupational, speech and vision therapy. She loves therapy and always works so hard. Danielle has very limited language, (she can say ‘Mama’ and ‘more’) and thankfully understands what is going on around her and always gets her point across to us! We ask her to use her words often so she does not lose the ability to speak them (she has sadly lost a few words over the years). Danielle uses several signs to communicate as well as verbalizations and gestures, such as smiling or whining to show her likes or dislikes. She can also shake her head yes and no, so we ask her questions in a way so that she can answer yes or no in response. Taking care of Danielle gets harder every day as she gets bigger and heavier. 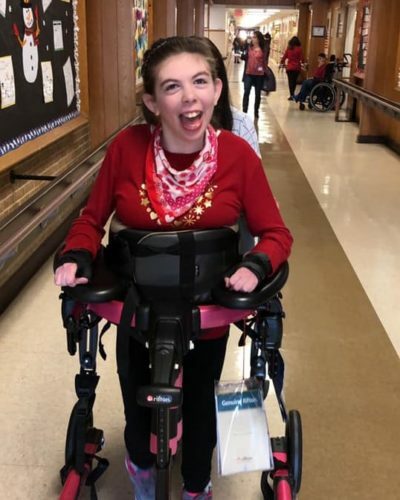 We have recently installed ramps on all entrances to our house, and last year we got an accessible van with a ramp which has made life a bit easier now that we are not lifting her and her wheelchair in and out of the car. We must plan carefully when going anywhere to make sure the space is wheelchair accessible. We can only hope that as Danielle get older that she stays happy and keeps the mental awareness she has now. Caring for her after we are no longer able to is a huge concern of ours, and it is something we struggle with daily. 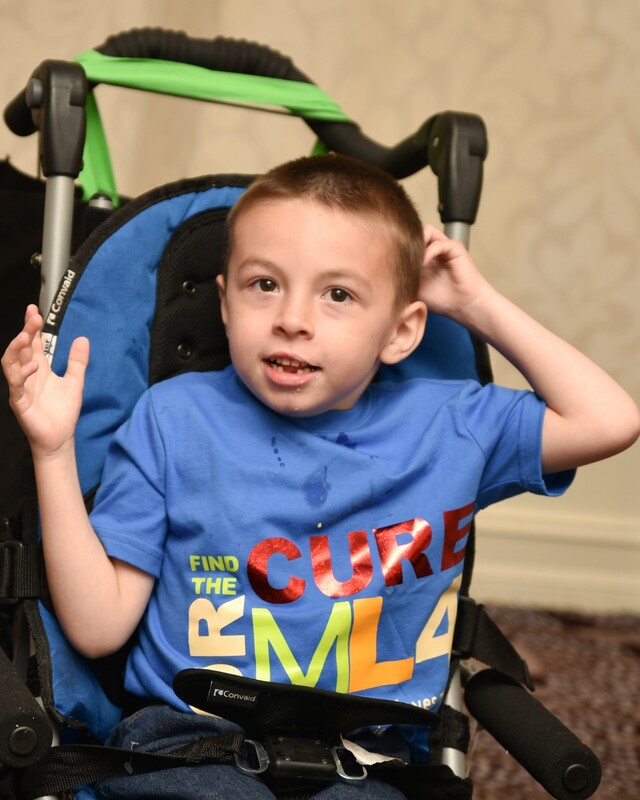 We are incredibly grateful to the ML4 Foundation for pursuing scientists, doctors and researchers willing to study this very rare disease. Huge strides have been made in recent years, but we know that there is still a long way to go. 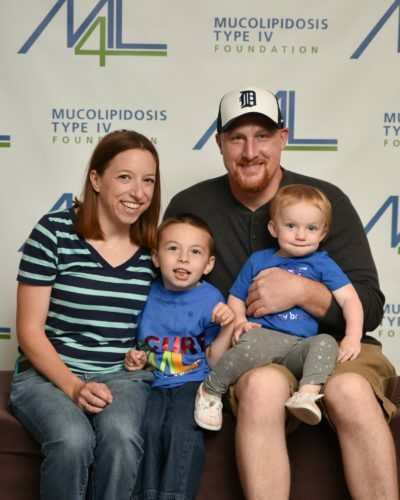 We hope the progress and momentum continues until the day that a treatment or cure is found for Danielle and the other beautiful children suffering from ML4. The biggest impact that the Foundation has made in our lives is connecting us to other families around the world who have kids with this disease. In spite of Danielle’s devastating ML4 diagnosis, we have gained a large global extended family with whom we can share our joys, triumphs and heartbreak. And for that we are forever thankful. We are Joel and Lidwine Brown, and we live in Lyons, France with Tommy (born in 2011) and his little sister Stella (born in 2017). 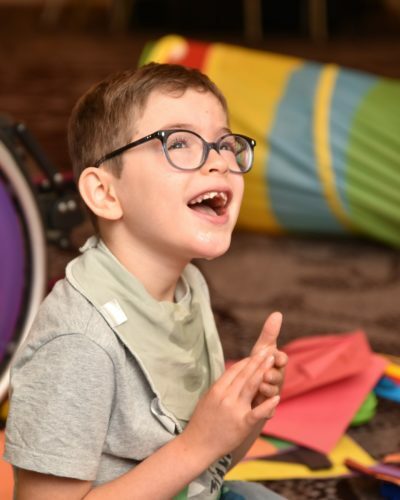 All those who know Tommy know that he is a smiling, laughing, sweet little boy, who loves his Mum and Dad and sister, is constantly asking for people to sing him songs and is always ready to boogie to his favourite music, whether it be Beethoven or the Jackson Five ! Tommy hit a lot of his milestones in his first year and a half, and although he hit most of them a bit behind other children, his pediatrician told us to wait and give him time. When by eighteen months he still wasn’t walking, though, we started to worry. After dismissing an initial suspicion of autism, a new doctor suggested we see a neurologist. To be honest, it was a relief to have specialists agreeing that we weren’t crazy and that there might be something that needed to be looked into. 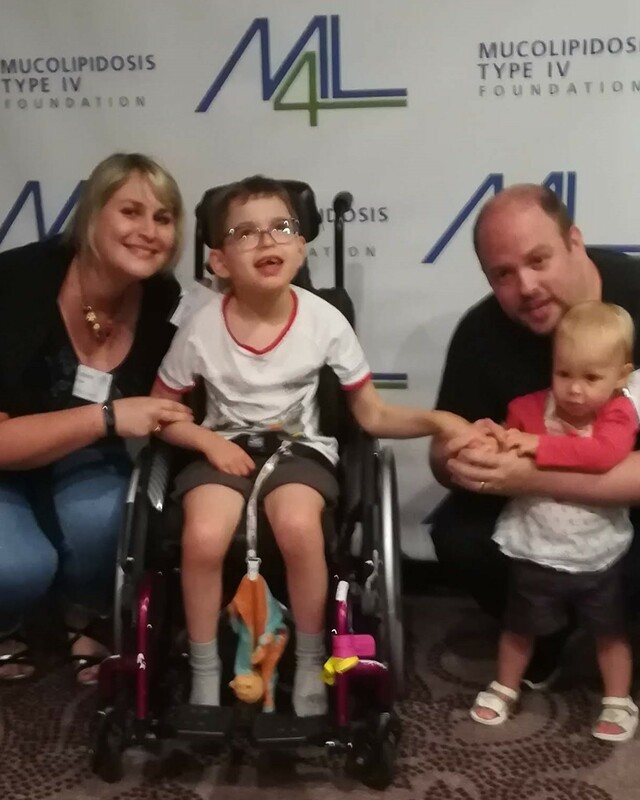 After an MRI, we discovered that Tommy had a delay in myelinisation; in other words that he didn’t have as much of the special matter that allows our neurons to fire faster and exchange information more efficiently as other children. Although that was already quite a shock, we soon discovered that Tommy’s eyes also seemed to have issues, issues that were eventually revealed to be corneal clouding that we were able to temporarily solve with a double transplant. It was the combination of both those factors that led to a geneticist here in France testing him for ML4. After spending a year in maternelle – the French equivalent of kindergarten – with a special aids assistant to help him, Tommy got a place in a Centre for Motor Education, which combines physical, speech and occupational therapy with adapted school time and time in an educative group. 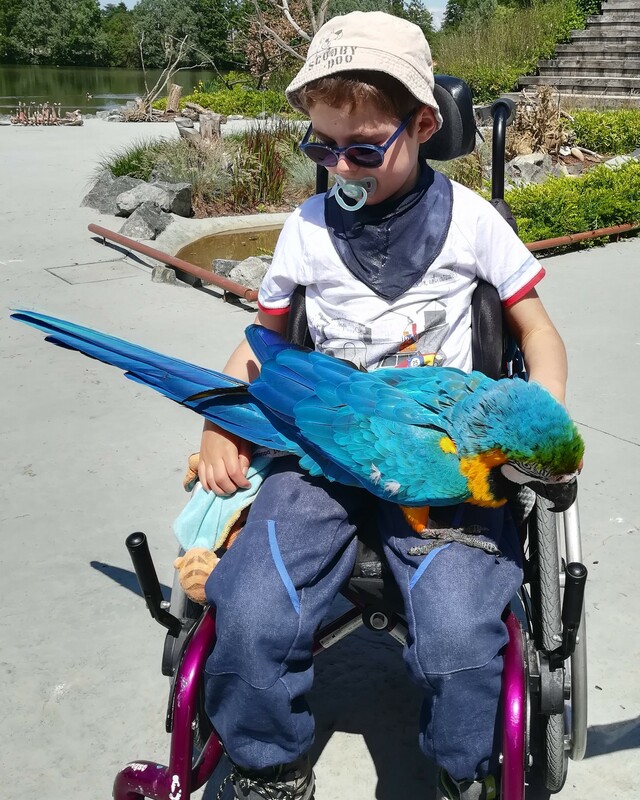 Although over the school year these therapies are tiring, they have allowed him to make some amazing progress that we never imagined, such as moving his wheelchair around on his own. It is such a joy to watch him navigate corners and go in and out of rooms! While at home, most of the time he moves around on his hands and knees, doing his own inimitable bunny hop that gets him around faster than us sometimes! He can use a walker and can walk with our help holding his hands. His communication is generally done via a few hand signs that he has adapted to his capabilities, and a handful of sounds – Mama, Baba, Gigi (a Tigger toy) and yeah-yeah (his pacifier). He loves to dance, he loves to listen to music, and he adores any toy that lights up and makes music. Beyond the normal challenges involved in taking care of a child who needs constant help and supervision (carrying all 23 kilos, moving from wheelchair to seat to bed to bath, drops in his eyes every morning and every night, help eating, etc.) one of the most challenging aspects is doing day to day things that cause Tommy irritation and lead to him shouting or screaming angrily. Just taking off pyjamas and putting on clothes, or changing diapers, can be a real mental strain, as we have to try and keep him calm at the same time. Added to that is the fear that these things will become more difficult as the years go by, especially since it is very likely that his eyesight will become more and more impacted. 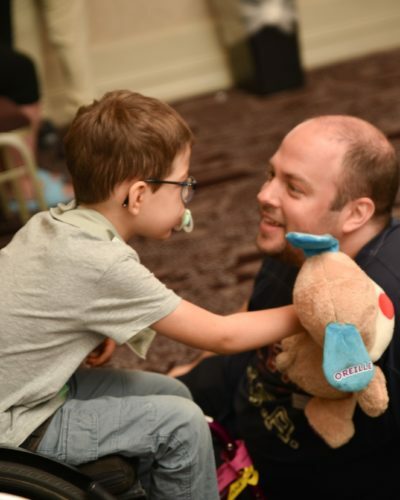 For us, the ML4 Foundation has been first and foremost a place to find other families who are going through the same things we are, an extra source of comfort and support for the day to day challenges that are difficult for other people to understand. As much as possible, we try to participate in the Foundation’s various missions, including fund raising and giving as much information as possible to improve the natural history. We would love to do more, though distance and borders make it a bit difficult sometimes. The Foundation has given us hope that somewhere down the road there may be a solution for Tommy and the other ML4 kids, that we might be able to see him walk or talk one day.